I have been testing a few bits from the Bliss range recently and here are my thoughts about the first product I want to review. 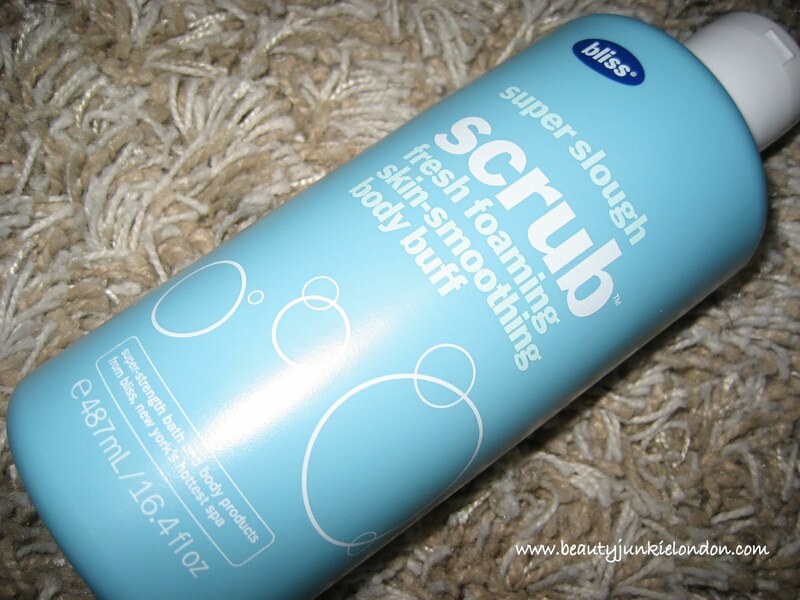 Bliss Super Slough Scrub, a liquid based exfoliator which is packed with little blue exfoliating beads. The first thing that struck me about the bottle is that it is pretty huge – 487ml (I wonder why it wasn’t 500ml???) and I really like this. I like that I can use fairly big hand fulls of this without thinking eek – it’s going to run out, I need to scrimp! This is really packed with exfoliating beads, so actually does a good job. There are tons of exfoliators that I have used that have lots of scrubby-bits, but in an oil base – I don’t find these work as well. The soft and smooth feeling is lovely, but it is more of a result of the oil coating the skin, rather than the dead skin being sloughed off. I think this one does a really fantastic job of scrubbing off the dead skin whilst also leaving skin clean but not dried out. Close up of the liquid – you can see how packed with exfoliator beads. This scrub is really soapy – it has a very ‘soapy’ smell and lathers up, which is quite unusual for an exfoliator. But I like it, it smells and feels like it’s doing a good job. As I mentioned before about it not leaving skin dry – this impresses me, as with the soapy lather and smell it’s easy to assume it can be drying like a traditional soap. But this isn’t the case – skin is fine, but I do still slather on the mosituriser after a scrubbing sesh (but I do this after every shower, so that’s just me). SO all in all I really like this scrub – it’s not cheap at £25, but it is huge so will last a while – and this is preferable to a cheap scrub that doesn’t work as well, so you have to use buckets of it each time to actually get the scrubbing effect. What I’m trying to say is that this is expensive, but offers good value for money. Would I buy this again? Hmm, it’s a tough one – I think so although I can’t help but think of my ‘holy grail’ exfoliator: Clinique’s Sparkle Skin – I love this and would find it hard if I had to choose the Bliss version over this. But, my personal preferences aside – this is a lovely exfoliator that does a great job and is nice to use. I have a couple more reviews of products from Bliss coming up over the next few weeks. But to find out more about the range available you can visit the Bliss website. This product was provided free for consideration for review. All opinions are honest and impartial, regardless of the source of the product. Thanks so much for the great review – we’ve been really keen to try out some bliss stuff for a while but aren’t too sure where to start. We need an exfoliator so maybe this could be the first step…! I’m always looking for good body exfoliators, given that i’m sick and bored of the St Ives apricot scrub. Maybe i can consider this one for a haul. What i like to do is to mix a part of my usual body (or face) wash with table salt and lemon juice. You can almost feel the lemon doing a soft chemical peeling on your face and body.